Besides Italy, I’m in love with Spanish wines. Spain is doing some cool things, using more modern winemaking methods, going easy on the oak treatments, and the geek grapes are making comebacks (much like Italy). Although today’s wine may not necessarily be classified as geeky, the region however, might be. Enter Montsant, who’s next door neighbour Priorat gets all the laud and glory, but given the proximity of Montsant, some producers are choosing to pay lower prices for land, and make from there at a fraction of the price, and on similar soils! Priorat wannabes? Nope…they have an identity all their own, and I’ve tasted some real beauties from Montsant lately. Trust me on this one. I had the pleasure of meeting Jurgen, a German winemaker at Cellar de Capcanes in the store a few months ago. It seemed a bit weird to me to see a German winemaker in Spain, (I guess no different than seeing a French winemaker in Australia or a Spanish winemaker in the US…) but alas he loves Garnacha and is (obviously) doing great things with it! Even Kosher! It helps too, that his wine belongs to one of my favourite importer portfolios! Kudos Enotri for bringing in well made wine! 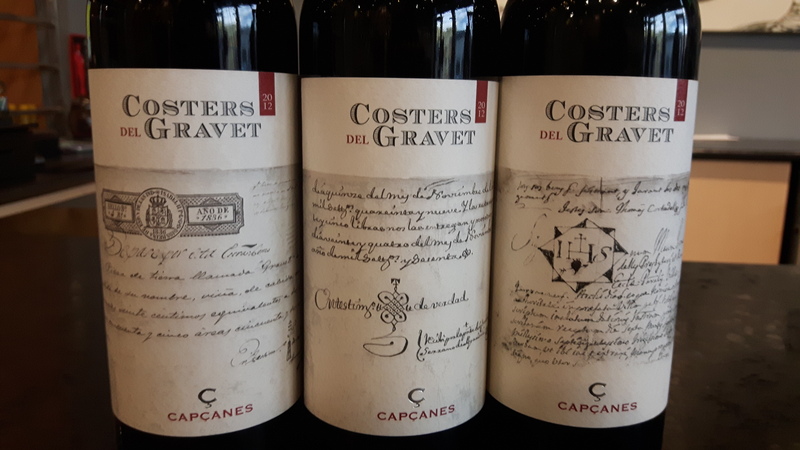 The 2012 Costers del Gravet has 3 different labels featuring the original deeds of the land. Pretty cool. What’s inside the bottle is even better! The juice is 60% Carignan (like what Priorat features as its main grape), 25% Grenache and 15% Cabernet Sauvignon. Good old Cab Sauv, making it into the blend yet again! Aged for 12 months in a combo of both new and 2-year old oak, this wine is super dark ruby with colour that stains the glass! Black cherries, red plums, spicy oak with balanced tannins, acidity and alcohol with a great long finish! And all of this…for the smashing price of $35.95! Cin Cin! This entry was posted in Joy of Wine, Varietals, wine and tagged Cabernet Sauvignon, Carignan, Enotri, Garnacha, Montsant, Priorat, Spain. Bookmark the permalink. Good post. I traveled the Monsant and Priorat areas this past fall on a bit of a wine tour sponsored by Catalunya Wine. Loved, loved, loved Priorat and it’s non-touristy, endearing style. I think that I ‘get’ wine but Monsant’s wines seemed just as robust, earthy and spectacular as those of Priorat. And, as you say, it doesn’t cost $40 CAD just to try it. Dream to go there for sure. Super impressed with the wines of both Priorat and more so Montsant lately. We have a beautiful Rosat called Mas Donis in the store from Montsant that is beautiful and only $19 CAD. Cheers! I’m completely smitten with Spanish wines, have been for eons. I’ll admit I don’t buy as much from Catalunya as I do Ribera del Duero and Rioja . . . but man, amo el Tempranillo!! Salud! seriously loving the wines from Catalunya and Galicia lately!